Home Decorators Collection Yorkhill Oak takes the season's most on trend taupes, greys and reds and skillfully weaves them into an incredibly realistic distressed oak decor. 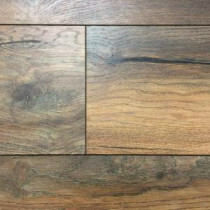 The look is rustic; this exquisite floor showcases the knots and cracks found in costly reclaimed wood. Home Decorators Collection Harbour Oak is the perfect floor for extreme levels of use. With its high-density, 12 mm thick planks and an especially wear-resistant surface, it can cope with pretty much anything to which it is exposed. The AC4 rating is suitable for commercial use as well as active residential households. 18.2 sq. ft. per case. Case quantity: 7. Case weight: 37.9 lb. Buy online Yorkhill Oak 12 mm Thick x 7-7/16 in. Wide x 50-5/8 in. Length Laminate Flooring (18.2 sq. ft. / case) HC02, leave review and share Your friends.